Dan Dare has never been adapted as a live action series. There have been a number of radio adaptations over the decades and there is even another audio series scheduled for release this year, but sadly the Pilot of the Future has never really had that big a life outside of the comic book medium. In this article I am going to explore what might have happened if there had been a Dan Dare television series in the 60’s. Who could have played Dan, The Mekon, Digby, who would have written for it, how would the series have tackled bringing to life the terrifying monsters, impressive spaceships and bizarre planets to life? Pretend that the subsequent review fell through a portal from an alternate universe where Dan Dare was adapted to tv in the 60’s. In 1965 Britain was in the grip of Dalekmania. Nobody could have predicted the success of Doctor Who, not even the BBC themselves who had expected it to run a mere 13 episodes. Ultimately thanks to Terry Nation’s fabulous creations the Daleks Doctor Who had taken the entire country by storm and ITV naturally were somewhat envious of the success. The BBC were not only winning the ratings war thanks to the Daleks, but they had also made a fortune on spin off material, comic books, toys, costumes, stage plays, even a big screen film adaptation starring Peter Cushing. For a television series to produce this kind of merchandise and material was at that point completely unprecedented. ITV wanted to produce a science fiction series that could rival Doctor Who and allow them a chance to cash in on the new sci fi craze. Many new proposals for science fiction series were considered, but ultimately ITV turned to the Eagle’s flagship character Dan Dare. Dan Dare had been Britain’s most popular comic book throughout the 1950’s with sales at one point reaching as high a figure as 3 million. Though its popularity had declined somewhat throughout the 60’s ITV still felt that it was a good candidate to base a television series on as it already had a large fan base and audience. The series script editor was David Whitaker who had just left the same position on Doctor Who itself. The series was produced by Barry Letts meanwhile who would later go on to work on Doctor Who. ITV were determined to make this series seem more sophisticated than Doctor Who however and thus not only was it allotted a larger budget, but it was also made in colour. The effects for the series were initially supplied by Ray Harryhausen using his stop motion process. Sadly however as this was too time consuming he was dropped from season 3 on. Many viewers felt this was to the detriment of the show. Dan Dare remained the only tv work Harryhausen did throughout his long career. The cast included some very well known actors including horror icons Peter Cushing, Christopher Lee and Vincent Price. 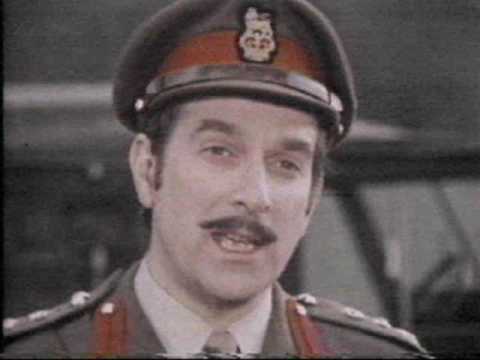 The part of Dan meanwhile was given to a then relatively unknown Nicholas Courtney who would ironically become well known for appearing in Dan Dare’s rival Doctor Who as Brigadier Alistair Gordon Lethbridge Stewart. The series was initially quite popular and would draw in audiences of round about 8 million for its first few series. Much praise was heaped on its special effects and strong cast, and it also increased sales of the Dan Dare comic book which at that time were in a slump. The show also broke new ground by being the first British series to feature a black actor among its lead cast. A then 14 year old Don Warrington who played Flamer. This provoked some controversy among fans of the original comic strip for deviating from the source material by changing Flamer’s ethnicity. Still the producers argued that this was close to the spirit of the original comic book series as it promoted equality by depicting a multi ethnic version of the future where there was no prejudice. The series naturally drew many comparisons to Star Trek due to its multi ethnic cast and up beat, optimistic tone. Sadly the series ultimately did not have the same staying power as Doctor Who. Its viewers and quality began to dip after series 3 and after a 5 year run it finished in 1969. The series throughout the 70’s would be sold to other countries where it would develop an audience. Ironically the original comic book version of Dan Dare had never really had a life outside of the UK. The series would catch on in America in the late 70’s, early 80’s following the success of the Star Trek movie as well as Star Wars and even Doctor Who itself which finally managed to catch on in America. This coupled with the rise in popularity of sci fi in general, and the success of the new Dan Dare in the revamped Eagle ultimately made ITV revive their Dan Dare series in 1984. This sequel series would be produced by another Doctor Who veteran Philip Hinchcliff who had been a fan of Dan Dare as a child, having based the design of Davros, the creator of the Daleks on the Mekon. This series was based on the 2000AD Dan Dare comics and featured none of the returning cast from the original. Despite this it was intended to be a sequel and it utilized the idea from the 70’s series that Dan Dare had not only be cryogenically frozen for over 200 years, but that he had also been horrifically scarred in an accident which resulted in his whole face being reconstructed to look different using surgery, which in turn allowed another actor to play him. The producers had originally wanted David Bowie to play Dan as the 70’s version had been based upon his Ziggy Stardust persona. Sadly he was busy with other commitments. Bowie later expressed regret over this as Dan Dare had been one of his favourite childhood heroes. 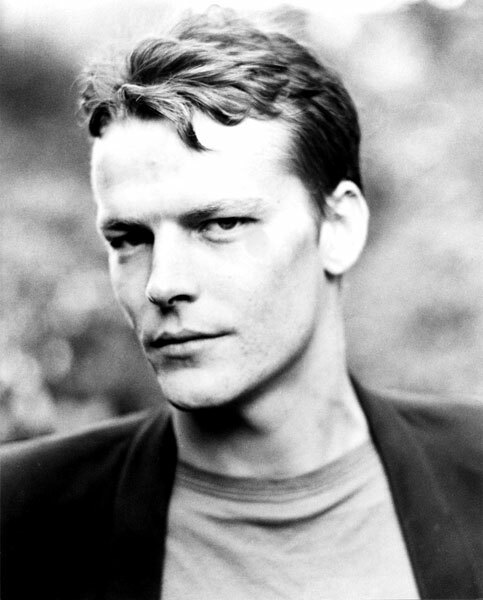 The role eventually went to a young Iain Glen who would later become best known for playing Ser Jerah Mormont in Game of Thrones. Among the shows other cast included Tim Curry, Rik Mayall, Adrian Edmondson and Tom Baker. Reflecting the comic books the tone of the series was much darker with main characters more likely to be killed off. It was seen as a spiritual successor to the recent Blake’s 7 this way by many critics. The series theme was written by Brian May who had been a life long fan of Dan Dare. Much like the original the series was a success at first and ran for 5 series until 1988. Its decline in ratings during its final few years was attributed to the decline of the popularity of sci fi in general in the UK. Indeed next year Doctor Who itself was cancelled after 26 years, whilst in just a few years time the revamped Dan Dare would finish after a 13 year run too. In the decades since there has been talk of another sequel or a reboot which has sadly never come to pass. Big Finish did produce an audio series based on the 80’s series which saw Iain Glen reprise his role as Dan, but sadly to date there has been no tv revival yet of the pilot of the future’s exploits. At 10 years in total it remains the second longest British science fiction series and one of the worlds longest running and most iconic sci fi series. 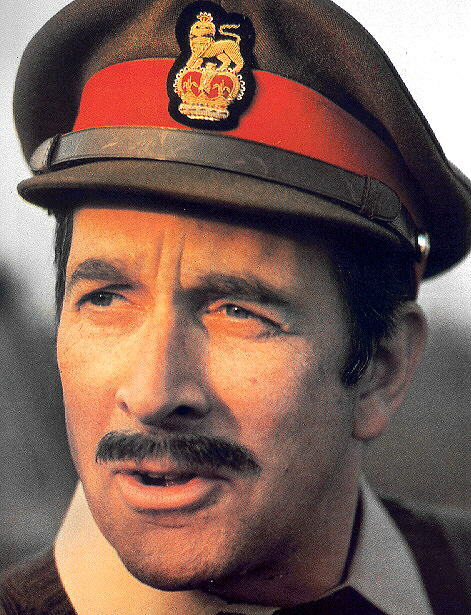 Nicholas Courtney was perfect in the role of Dan. He not only looked the part, but he perfectly emboided the authority, and stiff upper lip, no nonsense aspects of the character superbly. Sadly for Courtney whilst he was very popular in the role I think he was somewhat typecast as the dashing, man’s man army hero afterwards. Certainly his other most famous role, that of the Brigadier in Doctor Who only came about because of his performance as Dan Dare. Still it was an excellent performance nonetheless and really helped to carry the series. Naturally there is a huge debate among fans as to who was the better Dan, Courtney or Glen. Personally I don’t think its fair to compare them as they were both playing very different versions of Dan from different generations and ultimately I think they both were just as successful in capturing the spirit of each version of Dan. At the same time however I will say that Courtney’s Dan is by far and away the most iconic. Whenever you see a spoof of Dan Dare in popular culture its always Courtney’s image they use. Indeed you will always see Dan with a moustache which the character never had in the comic books pre Courtney. On the other hand however Courtney’s Dan was perhaps a bit more one dimensional than Glen’s, though I think this was due to how it was written more than how Courtney played it. Overall Courtney did an excellent job in bringing Hampsons hero to life. Michael Ripper was best known as a character actor in many Hammer movies. Digby was the only leading role he ever had. He was every inch the perfect Digby both physically and in terms of his performance. He captured the innocence, loyalty and somewhat bumbling yet resourceful nature of the character excellently. Andre Morell made a career out of playing authoritative, professorial, somewhat old fashioned characters such as Professor Watson and Bernard Quatermass and thus was a natural choice for Sir Hubert. 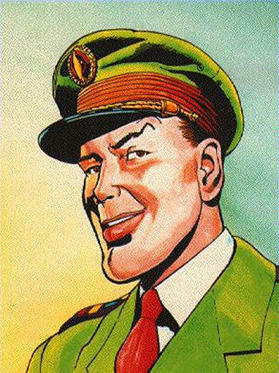 I think Sir Hubert was a tricky character to get right as he is intended to be the old fashioned character whose out dated values such as not viewing men and women as equal (which actually reflected the norm more at the time of the original Dan Dare comics in 1950) clash with the modern day younger characters. Thus naturally its hard to make an old fashioned sexist seem somewhat likable, but Morell managed to make the character seem like more of an old fashioned gentleman than anything else which helped to soften some of his attitudes towards Peabody. Barbara Shelley was the producers only choice for the role of Peabody and its not hard to see why as she was excellent, though apparently she also refused to dye her hair blonde which resulted in red haired Peabody instead. Fortunately the makers of this series kept up the feminist spirit of the original Dan Dare comics and Peabody was shown to be a capable, strong, intelligent and independent female character like in the source material. There was also no romance between Peabody and Dan either, despite the obvious chemistry between Courtney and Shelley. This was not only to remain true to the source material, but also because much like Doctor Who the series was aimed at a family audience and so therefore Dan and Peabody were both rendered completely asexual. Shelley won great acclaim for her role as Peabody. She has said that many young women to this day have told her that Peabody directly inspired them to become scientists as it was the first time they had ever seen a woman on television play such a role. Christopher Lee had never heard of Dan Dare prior to appearing in the series, but he nevertheless was eager to play the role as he felt it would give him a chance to break free from his typecasting problem of always playing the villain. Sadly despite the popularity of the role I don’t think this really helped him break free as it was another monster part. Lee was perfect in the role. His previous experience acting under make up in classics like the Mummy coupled with his strong voice allowed him to inject a lot of personalty and presence into the character. He was able to make him seem strong and powerful in certain scenes and inject a lot of vulnerability into him when he was experiencing his first emotions. Cushing was absolutely superb as Dan’s archenemy. His quiet, soft spoken voice really suited the cold, logical and scheming Mekon. Many have compared Cushing’s performance as the Mekon to his later more iconic role as Grand Moff Tarkin. Both icey, ruthless intergalactic tyrants. Personally though I prefer The Mekon as I feel it gave Cushing more to do and it was brilliant watching Cushing as the villain go up against Christopher Lee as the hero too. It was just a total inversion of what we normally see in their most famous collaborations. The make up for the Mekon was spectacular too. Sadly they didn’t have the effects to make the Mekon hover. Instead he simply sat in a large yellow chair which completely covered his bottom half. Cushing’s naturally thin and slight frame also made him a good choice for the character too. Cushing said that he found the extensive makeup which took 3 hours to apply very difficult to act under, but that he enjoyed playing the villain none the less and cited it as one of his favourite roles. Xel was Dan’s second archenemy in the comics and thus he was a natural candidate to appear in the series. His portrayal in this series however was somewhat different to his comic book portrayal as he here he was depicted as a more insane, intense character. 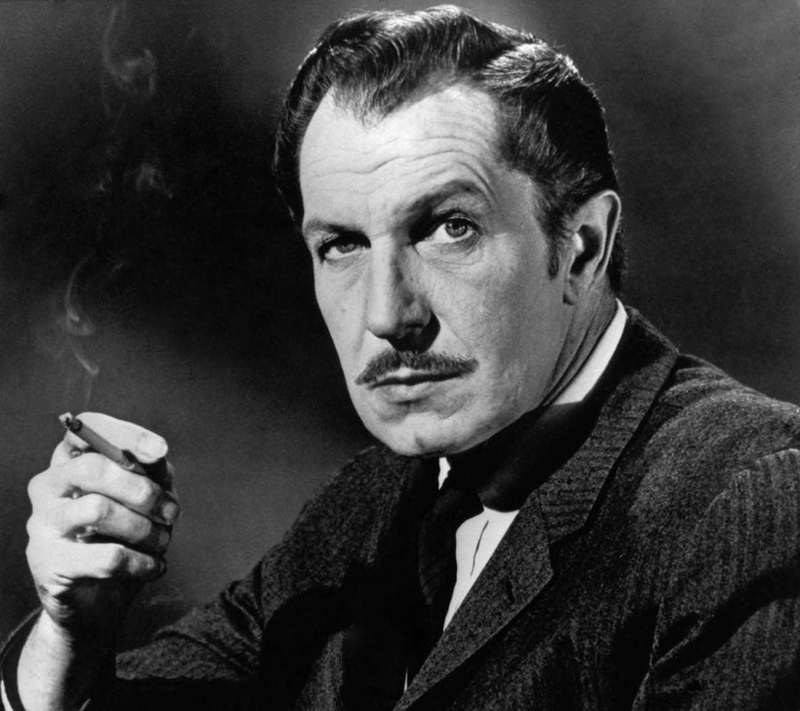 No doubt this was to tailor the character to Vincent Price’s personality more. Whilst some complained that this was a deviation from the source material personally I loved Price’s performance and I think the more crazy Xel served as a good contrast to the cold and logical Mekon. Cushing and Price obviously played off of one another brilliantly. I don’t think Xel was quite as good a villain as the Mekon, but then again he never was as the Mekon is Dan’s ultimate enemy, but Vincent Price as an evil alien overlord is always entertaining. Glen’s version of Dare was a lot more intense and dramatic than Courtney’s. This of course reflected the 70’s version of Dan Dare. Just as with the comic books there were some complaints from fans about this not being the Dan they remember, but I think that Glen’s performance suited the darker tone of this series. Whilst his Dan may not be as iconic as Courtney’s in some ways I think he was more human. We saw more sides to his character, we saw him lose his cool, make mistakes, mourn his friends like Monday and even fall in love. This series really fleshed Dan out like never before and Glen’s performance definitely benefited from it. At the same time of course Glen had as much authority and presence as Courtney in the role. I think that Glen’s real strength was in capturing the loneliness of this version of Dan who was very much a stranger in a strange land having been catapulted 200 years in the future. The character of Monday was only a minor character in the original comic books, but his role was greatly expanded in the series. 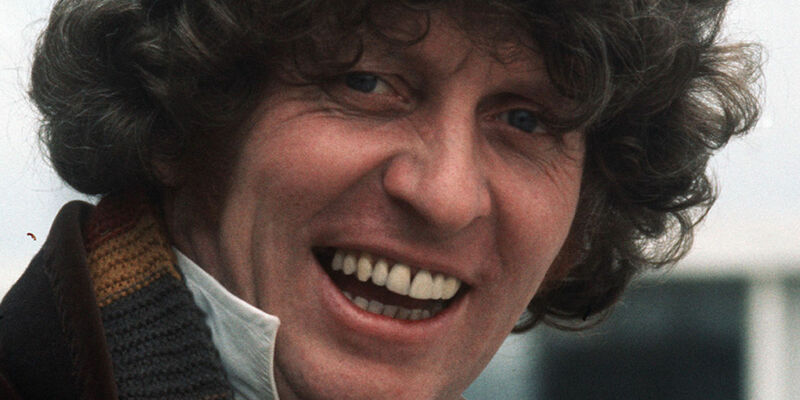 Tom Baker was obviously the perfect choice for the enigmatic, mysterious, otherworldly alien. He was a lot more toned down here than as the 4th Doctor. I was pleasantly surprised to see Tom give a more subdued, thoughtful performance here rather than just play Tom Baker again. Its one of his best performances. Dan’s brief love interest from the 2000AD comics was much like Monday expanded to become the main female character in this series, effectively replacing Peabody. Caroline Munro normally was only given smaller parts such as in The Spy Who Loved Me, so it was great to see her get a larger role as Doctor Rodan. A lot of people didn’t like the romance between Dan and Ziggy as they felt that Dan much like the Doctor was better as an asexual character. Still I must admit I enjoyed it as I felt that Glen and Munro had good chemistry with one another. One of Dan’s best friends in the comic books, Bear’s character was changed somewhat from his comic book persona. In the 2000AD comics he was just a slow witted, lumbering character who spoke in third person. Here he was merged with Rok to be an alien who was a member of a proud warrior race. Naturally Brian was superb as this character who was essentially just Vultan again. Its sad that Brian has been typecast as the big , hearty, shouty warrior guy, but its not hard to see why as no one can do that better than him. Much like Bear this character in the comics never really had a personality. He was really just one of Dan’s men with the gimmick being that he had a gun for a hand. This I feel gave both Bob Peck and the writers of the series a chance to really start from scratch in creating a new character. Bob Peck was an excellent choice for the character as he brought a lot of gravitas and presence to what would have been a fairly bland supporting character otherwise. One of Dan’s more unusual enemies, the effects used to bring this character to life were absolutely superb. Some fans have said that the effects look somewhat dated but I think they still hold up. Of course what really makes the Two of Verath such a wonderful character are the performances of Rik and Ade. Both spent their whole careers playing characters who hated each other but were forced to be together anyway. Thus its only natural that they would be the perfect choices for these two criminals who were literally sewn together. That’s all the two are basically is just Eddie and Richie if someone stitched them together, but it doesn’t matter as its hilarious. At the same time however whilst the Two of Verath did bring a lot of dark comedy to the series I also feel that they could be very menacing too. 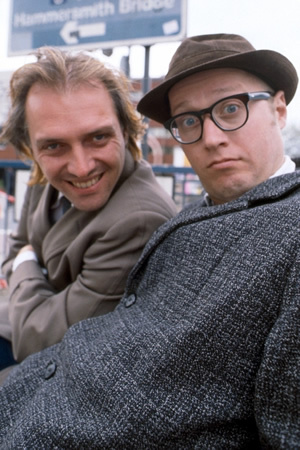 The thing about Rik and Ade’s comedy act is, if placed in a serious environment then it can actually be quite scary. The characters they normally play like Richie and Eddie are violent, sadistic, homicidal perverts, but obviously in something like Bottom they are so cartoonish then its funny. In this instance however it takes on a very dark tone. One of my favourite actors, the Dark Lord one of Dan’s biggest enemies in the comics was not quite as colourful as the Mekon. He was a bit more of a straight forward, generic evil space emperor, but Tim Curry’s gloriously over the top performance manages to elevate the character to being one of the most genuinely entertaining villains in television history. You can tell that Curry loved playing this character as he just absolutely chews the scenery in every scene he’s in with absolute relish. Much like Vincent Price’s Xel in the original series this helps the character to stand out somewhat from the cold and logical Mekon. According to Philip Hinchcliff Peter Cushing was approached about reprising his role as the Mekon from the original 60’s series. Sadly Cushings ill health and advanced age meant that he would not be prepared to undergo the heavy make up for the role once again. John Hurt was cast by Hinchcliff due to his previous experience acting under make up in The Elephant Man and his strong, distinctive voice. No explanation is given as to why the Mekon looks different in the show itself, though the make up applied did look somewhat similar and he was given a similar large yellow chair that once again did not hover. Hurt was short and much like Cushing had a slighter frame which made him a good choice for the character. Hurt’s Mekon was a more emotional character than Cushing’s. 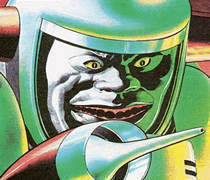 Though he generally kept his cool he was shown to be a more bitter hateful character as seen when he enjoys torturing Dan Dare in their first clash. Hurt was absolutely superb at playing the more sadistic, flamboyantly evil version of Dan Dare’s archenemy.